Some of the clearest nights of the year arrive in late summer and early fall. In much of North America, September and October bring clearer weather than any other month. If that's not enough incentive for you to get out and do lots of stargazing, consider what comes next. Last evening was one of those crisp nights with sparkling skies that urge me to take out the telescope and/or binoculars and do some observing. November tends to have increased cloud cover, which largely persists until mid to late spring. October is known to be the clearest of the 12 months throughout a wide span from New England through the South and lower Midwest to Texas and the Great Plains. 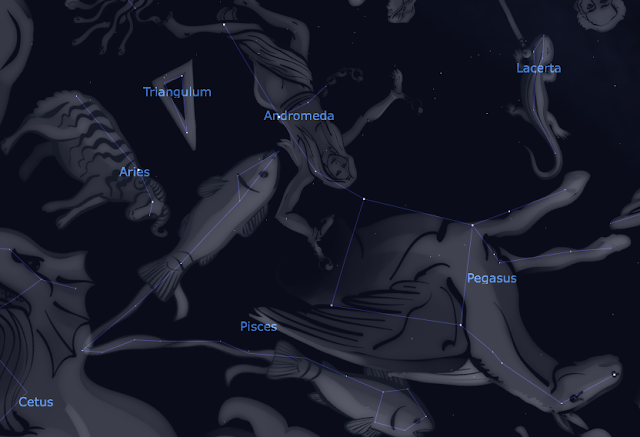 The Pegasus-Andromeda area spans a huge area of sky Screenshot from Stellarium. Much of the country is more than 70 percent cloudy in various months. In September and October, only bits of Maine and the Northwest are so obscured. However, from November through April as much as a quarter to one-third of the country is on the unfavorable side of the 70 percent "isoneph" (line connecting points of equal cloudiness). A mere absence of clouds is one thing, a beautifully clear and transparent sky is another. In much of North America strong cold fronts in September and October often clean the air to superb transparency. At such times we get deep blue skies by day and some of the best observing nights of the year. What stellar sights can we behold on these nights? In the early evening, there are fewer bright stars than usual. Arcturus is setting in the west-northwest, and the Big Dipper is getting low in the southwest. The only high and bright stars are those of the Summer Triangle: Vega, Deneb, and Altair. Capella is peaking up in the northeast. Above it, the forked branch of Perseus is ascending. Much higher is the "W" of Cassiopeia, the queen. Face east and look high and you will see the 2nd magnitude stars of Andromeda and Pegasus forming a very long, nearly horizontal line. It starts with Gamma Andromedae on the left, fastens to the Great Square of Pegasus, and ends with Epsilon Pegasi way over in the south.